And the desktop. 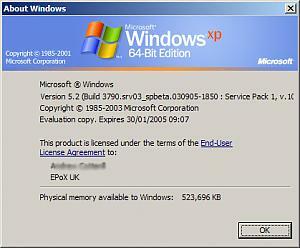 Note that under the WOW64 emulator included within Windows XP 64 bit edition - direct X 9 32 bit applications run with no problem or speed decrease when compared to XP-IA32/x86-32. I note that WOW supports PAE, which is good to see! For those who don't know, WOW is Windows On Windows, and is how Windows runs 32bit code on a 64bit processor when it's running in 64bit native mode. 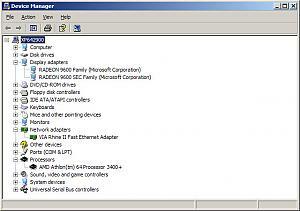 PAE is Physical Address Extensions, and allows 32bit programs to access more than 4GB of memory. 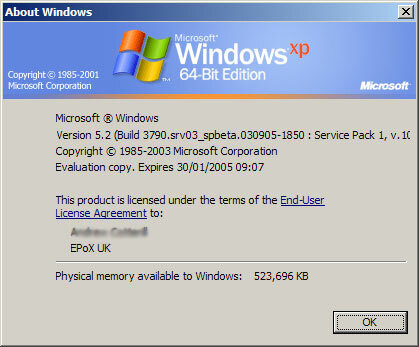 4GB is normally the limit that a 32bit program can handle, whereas a 64bit program can handle far far more! 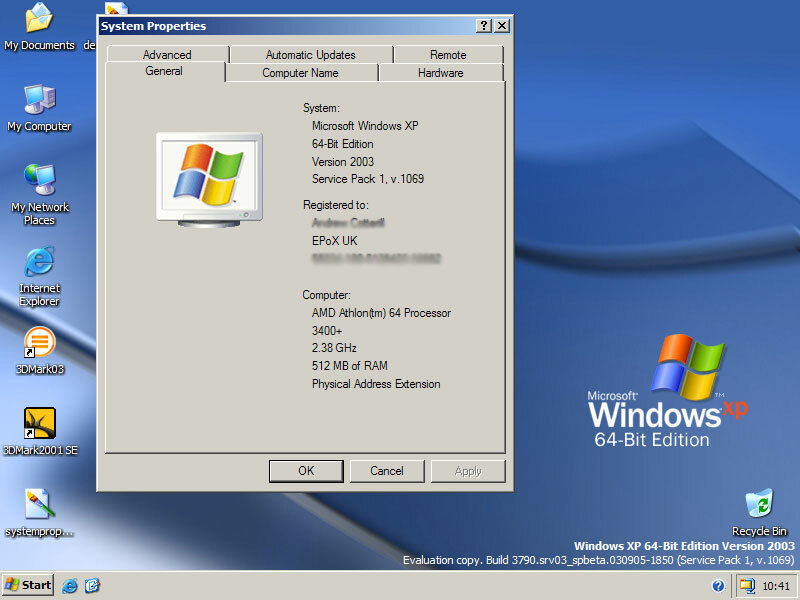 This stops problems when 32bit programs want to talk to 64bit programs. Last edited by Áedán; 5th February, 2004 at 03:49 PM. Available now to USA users Straight from Redmond for $13.00! See our front page for PRE-RELEASE info. I wonder how fast it is compared to 32-bit. 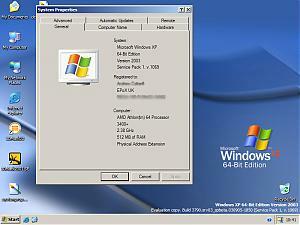 I notice that the trial version only runs on AMD64's and not Intel64's. I think anyone can download it, not just USA users. It maybe that it only applies to CD sales? While still beta.... its availability may trigger a significant increase in A64 sales. A Trial period of 360 days is HUGE!!! It is effectively a free OS for a year! As far as bugs in the beta... it's not like MS ever released buggy software before. I believe Microsoft already has an Itanium version out for a year? Itanium isn't really the kind of platform that a 754 pin A64 is - hence differing OS for the differing segments. It's not an anti intel thing - its a completely different technology thing. You can't run WIN NT 4 Sparc edition on a P3 for instance. With only 512MB of Samsung TCCC in there it is like lightning - hard disk performance is the biggy - because 64bit memory transfers are so fast natively, DMA is superfluous to what you are used to and IDE performance becomes like SCSI - it really is something else. You want to see how fast the textures load on 3DMark03. Put a SATA RAID array to it using the new Hyperion BETA and you will seriously end up with messy pants. Even if theres not much in the way of drivers yet (although as shown the ATi card used and EPoX NVidia cards all have fully 3D enabled drivers included within the driver.cab - you can play your games on it straight off). The OS is better than any other BETA I've ever tried in terms of stability and completeness. 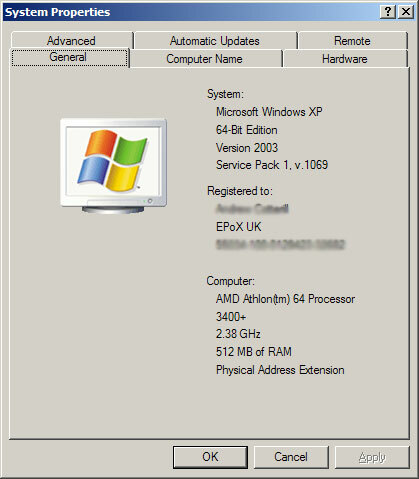 It comes with service pack 1 extensions and direct X 9 x86-64 already installed. Support natively for loads of Networking and SCSI stuff makes it wonderful. 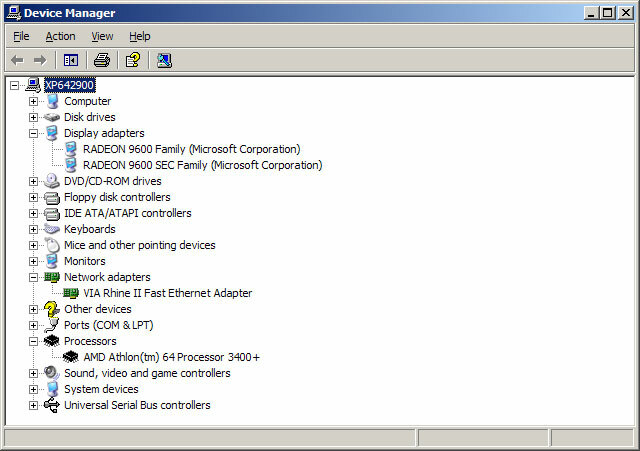 The only drivers I'm missing that work are for my 3com gigabit and sil image taurus controller. 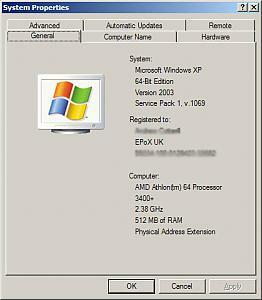 Shame that my laptop is a mere Pentium M !!! This may be the start of our greatest adventure! You'll find out next week mate! I believe you've ordered an EP-8HDA3+ and an Athlon 64 haven't you Dan ? I'm hoping we can get a group of 64'ers gathering to sob and gasp together as we plod along to meet our destiny! Fear ye not - I've only been toying with the chip for 12 months now!!! This is good news! I'm sure there will be a procedural question or two along the way!! OK! We split up, we all head out in different directions then meet back here in a week with our boards, CPU's and (are you feeling lucky?) our new 64 bit OSs.... or just bring a reasonable amount of curiosity and a hope for the future! Last edited by Daniel ~; 6th February, 2004 at 11:49 AM.